I don’t know about you but in the recent past, I had thought the debates in international development in this century had become rather stale. We had moved from Africa the “Hopeless Continent“, “Africa’s Growth Tragedy“, the continent of the “Bottom Billion” and the Trade vs. “Dead Aid” debate, to “Africa is Rising”, Africa “the Hopeful Continent“, Africa “the Next Frontier”, Africa “the Continent of Opportunity” and so on, all heralding Africa’s recent economic “successes” and the vast opportunities that lay ahead. Admittedly, some have adopted a more cautious approach to the overly optimistic Africa-is-Rising narrative. In the midst of this heated rising- or not-rising-yet debates, the economic historian at the Simon Fraser university, Morten Jerven, burst onto the scene with his position that “we have no idea if Africa is Rising” because we can’t trust the numbers. I came upon Jerven’s work sometime last year through several fascinating academic and op-ed articles he wrote about development statistics and more recently, his foray into the Africa-Rising debate. 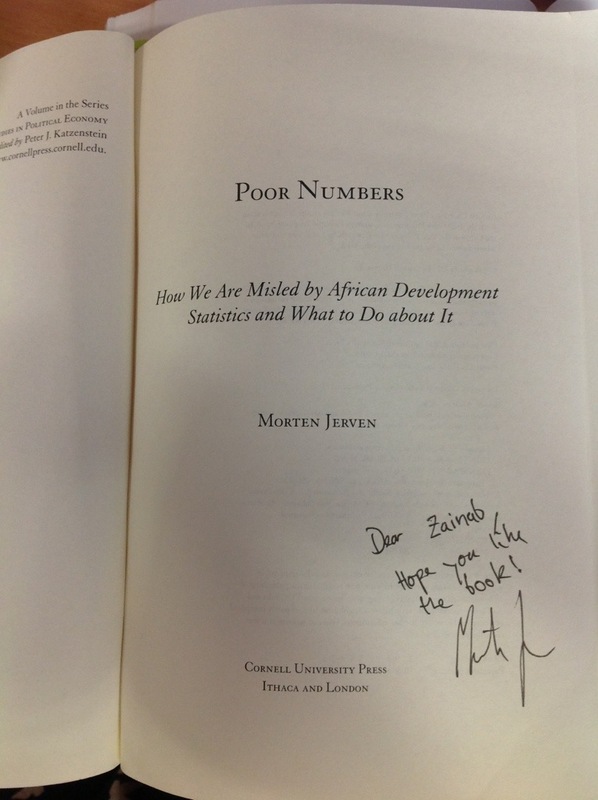 Coincidentally this week, Jerven was at my department to talk about his recently published book, Poor Numbers: How We are Misled by African Development Statistics and What to do About It, in a very “lively and refreshing” (words used by at least three people who attended) seminar. The main thrust of his argument is that statistics on African economic development (estimates and growth series on poverty, income and population) are unreliable because of the poor statistical capacity of many Sub-Saharan African (SSA) countries from which data on these indices are derived. He notes that it is these data compiled by severely under-equipped national statistical agencies that are used by international financial institutions and development agencies of rich countries. Jerven points that in extreme cases such as Somalia where economic data is not always available, the World Bank sometimes adds up economic data from neighbours Kenya and Sudan, calculates an average from these, and then uses this average to make projections about Somalia! Jerven posits further that the Strucutral Adjustment Program (SAP) of the 1980s had a devastating impact on the institutional capacity of such statistical agencies, and that the Millennium Development Goals (MDGs) agenda arguably further aggravated the situation because it put pressure on stretched and poorly-equipped statistical offices to prepare reports on social statistics related to the MDGs. This sort of pressure for specific data is symptomatic of a problematic trend towards collection of “ad-hoc data” by poorly equipped agencies, as the basis of “evidence-based policy” which in actuality ends up being “policy-driven evidence”, says Jerven. He thus makes a convincing case for improving the national statistical capacity of individual African countries in order to generate more accurate and reliable data, which he argues, have a huge impact on the welfare of citizens in Sub-Saharan African countries. Indeed, the fact that a number of African countries including Nigeria, are presently reviewing their Gross Domestic Product (GDP) base estimates which is certain to increase their national income, arguably confirms some of his core arguments. We are all familiar with how Ghana overnight, transitioned from lower-income to middle-income status on the 5th of November 2010 after the revisions bumped its GDP up by 60%. Nigeria’s GDP rebasing currently underway could see a huge rise in national income by 60% from $247 billion to $395.2 billion according to the Nigerian National Bureau of Statistics. Jerven says this revision could capture other economic sectors previously excluded which he equates to “40 Malawis (that) exist inside the Nigerian economy”. That is profound! One important question however, is that even if the numbers are more accurately captured in these GDP revisions, and we realise that many SSA countries we hitherto thought of as “poor” or low-income countries, are actually closer to “emerging” or middle-income status, what do these numbers really mean for poverty reduction and human development? Are the poor and deprived in these countries leaving the poverty trap enmasse into middle class status? The statistics may be getting better, but are people’s lives getting any better? Importantly, what implications do these revisions have for the very definition of poverty and deprivation — would these concepts need to be revised and redefined too? These are fundamental questions that policy makers, development experts and researchers ought to, and are hopefully thinking about. I would argue with Jerven on the point that the MDGs ‘further aggravated the situation because it put pressure on stretched and poorly-equipped statistical offices to prepare reports on social statistics related to the MDGs’…..the flip side could be that the MDGs incentivised governments to increase funding for data generation due to pressure to ‘report’ on their progress or not to the international community….ofcourse the quality of the end product leaves much to be desired ….i do agree that the ‘project-driven’ nature of funding to statistical offices deprives them of the capability for long term institutional development. Getting politicians to invest in offices that produce data confirming their lack of performance is quite a challenge…i hope Jerven addresses that! Using the rate of GDP to measure development or poverty reduction can be misleading. As a matter of fact growth is not the same as development. This emphasis on growth rather development is annoying. Growth is about numbers and development is about people. For instance, oil was recently discovered in Tanzania, Mozambique, Uganda and Kenya, and their GDPs will surely skyrocket by the time they start exporting oil and gas; but that will not necessary mean they would develop accordingly or there would corresponding improvement in the well being of their citizenry. If Mozambique for example starts exporting, say, 2 million barrels of crude a day without investing in agriculture (which employs over 80% of its population), education, infrastructures, health, human capital etc, adult literacy will still remain around 47%, under-five mortality rate 138 per one thousand, and about 70% of its population will still be extremely poor even though its GDP rate would have increased by several percent. The emphasis should be on development which is partly reflected in Human Development Indices (HDI) of long healthy life (life expectancy), education and income. And I think the HDI ought to be expanded further because some very poor people can even live longer than some middle class or upper class people. It should include metrics that can be used to measure jobs/unemployment and minimum wage in view of the cost of living in a given country. When we start focusing on development and the standard of living of the citizenry, governments and leaders in the region will then appreciate that growth is meaningless except it is translated to real development. Let me start by saying considering how important this article is, I am still sorry Zainab not many people will read it to the end. That will be evident if you will compare the number of comments you will get on this to your previous writings, lets say “My Oga at Top”. But don’t worry Zainab it wasn’t your fault at all, it is actually because Africans are not interested in anything statistics! We fill our questionnaires in our rooms and you know that! I am only surprise that someone like Dr. M. Jerven is just getting to know this. What he is preaching is actually not new to someone like me, but what is new is that he was quick to point this hidden fact out to the rest of the world and I commend him for that. The NBS, the MDGs and even our academic institutions have all keyed into this practice of “cooking figures” to impress the government and the outside world. One of the many reasons is that we don’t know the value of statistics and we also don’t want to say anything bad about our people – deceiving ourselves thinking we are deceiving the world. Thank you Zainab.